It was 1917 and the US was about to enter the First World War. The “Ordnance Corps” division of the army responsible for equipping the troops, at the time led by General William Crozier, was at the center of everyone’s attention. With the imminent declaration of war, General Crozier quickly found himself managing a very complex scenario of mass production of war weapons. Arsenal, weapons and ammunition orders began growing to unimaginable numbers, and no one was able to understand the progress of all arms production activities. So, at Crozier’s request to know the delivery times of new orders, no one was really able to give a reliable answer. Crozier, however, needed to know when the armaments would be ready because the American army was already operating in war activities. As a result, orders quickly passed from a few hundred to millions of requests; the war was a very pressing issue. At the time, it was an impossible task, not knowing the progress of all activities, to estimate a delivery date according to production times. Traditional charts allowed the General to manage one item per sheet, but the stacks of charts did not make the task of compiling the information an easy task. In the meantime, the engineer Herny Gantt quite easily managed the factories he ran, thanks to an innovative management method that attracted General Crozier’s attention. 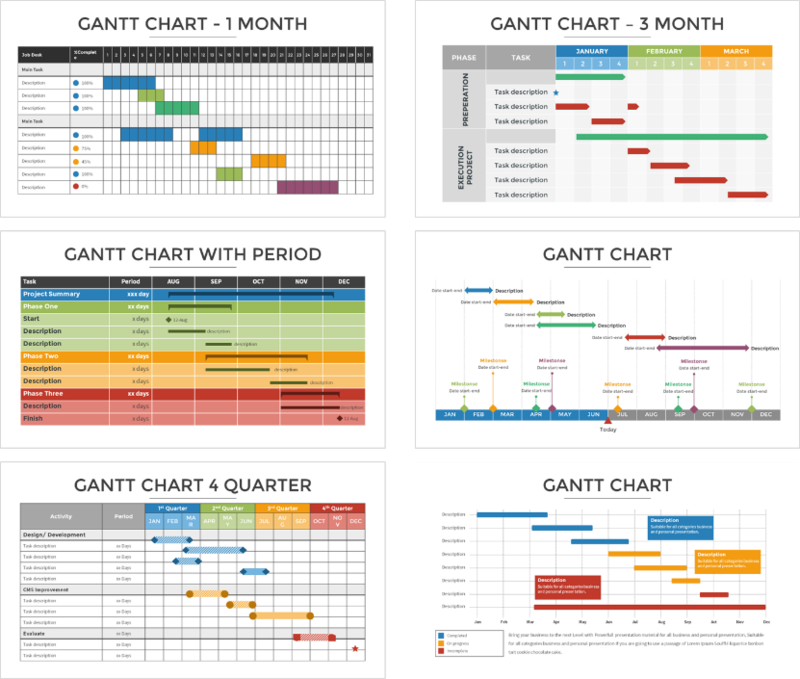 Gantt never patented the famous diagram and indeed, made it available to absolutely anyone. Thus the general was able to evaluate its effectiveness. Crozier decided to hire Gantt as a consultant for the American Army’s “Ordnance Corps” in Washington. 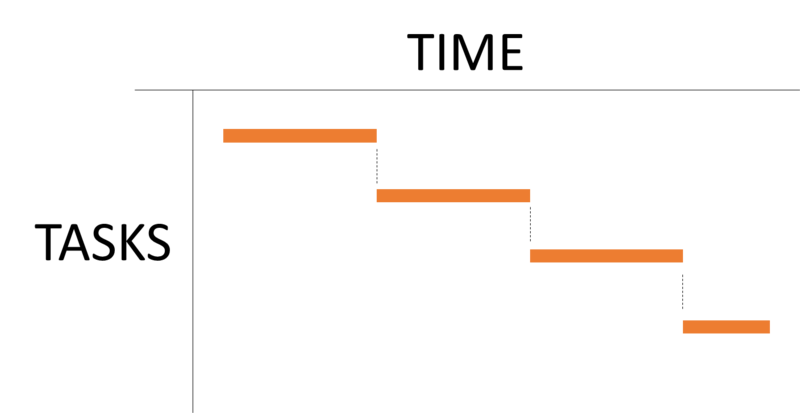 Gantt immediately set to work, focusing on the realization of a diagram showing the relationship between production performance and delivery promises. After the first few jobs were entered and the chart analysed, the General realized the potential of the tool to unequivocally define the responsibilities of any production delays. Thanks to the Gantt diagram, it was finally possible to know if an activity would arrive late, the impact of the delay on others and, consequently, to know and anticipate any delivery delays. Thus, within a very short time, the Gantt diagram was introduced into the US arsenal, helping in the production of aircraft and other government projects. ~Walter Polakov, “Principles of Industrial Philosophy”, presented to the American Society of Mechanical Engineers in December 1920. After its invention, the Gantt diagram immediately found application in many sectors, including industry in addition to military applications. Although the Gantt chart was revolutionary at the time of its introduction into the industrial world, today it is one of the most common planning and project management tools available. If you think about it, it’s not such a complex instrument; graphically, it is a set of horizontal bars that represent the progress of the activities over time. The bars shows the start and end date of activities and duration. With the Gantt, you can clearly understand the dependencies between the activities. Imagine having two activities: an activity “A” and an activity “B”, if the activity “B” needs the term “A” to begin, on the Gantt the dependence will be easily identifiable. After all, if it goes late “A”, the delay will automatically affect “B”, creating a cascade of issues. In short, this is the concept of dependence between activities that therefore arise as sequential activities. 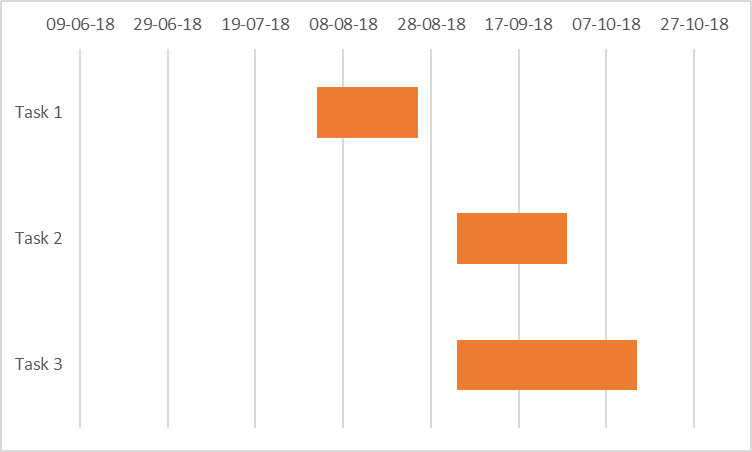 We can say that the Gantt chart crosses two main dimensions: the activities and the time allocated to their development (see figure below). • Timeline – Shows the duration of activities in hours, days, weeks, months, quarters, semesters, years, etc. • Vertical lines – Indicates current progress if broken. • Arrows – Link two activities and show that one is dependent on the other (that is, it begins when the first one ends). • Milestone – Shows key points of the project. For example, they could be moments of delivering results. • Bars – Show the complete duration of an activity. The bars can be colored according to their progress. 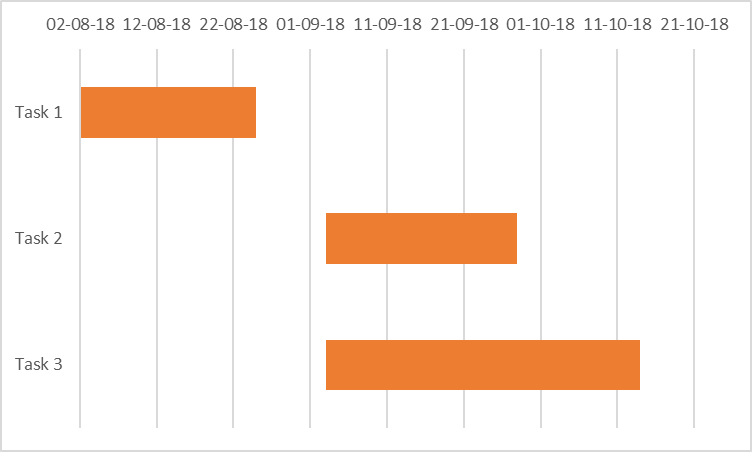 So, in short, the Gantt chart lists activities (horizontal bars) and milestones (triangles in the example) distributed along a timeline highlighting dependencies. The strength of the Gantt diagram is its ability to dynamically represent the set of activities over time, which, if viewed together, summarize the progress of the entire project at a glance. These are the words of Henry Gantt, who described the dynamism of the famous diagram. In fact, one of the best features of the Gantt chart is the ability to view the activities of the entire project, both those already completed and those planned in the future, at a single glance. However, the contingencies on the agenda and the plans are only estimates of how we hope things will go. In reality, there are always discrepancies in the times and activities that affect the project, and that the diagram can easily show if it is kept updated, thus the need to constantly update the Gantt chart over time as the project evolves. Gantt chart PowerPoint: With which tools do you implement and update your Gantt charts? The most common answers to this question are usually: Excel, PowerPoint, Project or some tools specifically created to create Gantt charts. Analyzing the literature, though rather dated (as you may have guessed from the quotes, Gantt charts as a tool are more than a few decades old), introduced one thing that made me smile. It was a particular chapter of the book, The Gantt Chart – A working tool of Management (Wallace Clark, 1922), which explains how to graphically create a Gantt chart, but the interesting thing is that in 1922, the way it was realized was with paper and nib (see figure below)! When we realize a project, we complain about the complexity of creating and managing Gantt diagrams, but I have to admit that seeing the sheet collector with handmade diagrams really makes me appreciate the current solutions, even the most artisan ones! I guess you don’t update your Gantt charts with paper and pen, right? Do you face the problem of having to update the Gantt every time there is important news about the projects, which has to be communicated to decision makers? How difficult is it to achieve Gantt in PowerPoint, which is then the main tool used to create presentations in business environments in the modern world? You can also use tools in the cloud or an app but in the end, honestly, how many times do you have to paste the diagram in your presentation by taking a screenshot of the app? Usually, you often see a copy from Excel, pasted directly into PowerPoint. 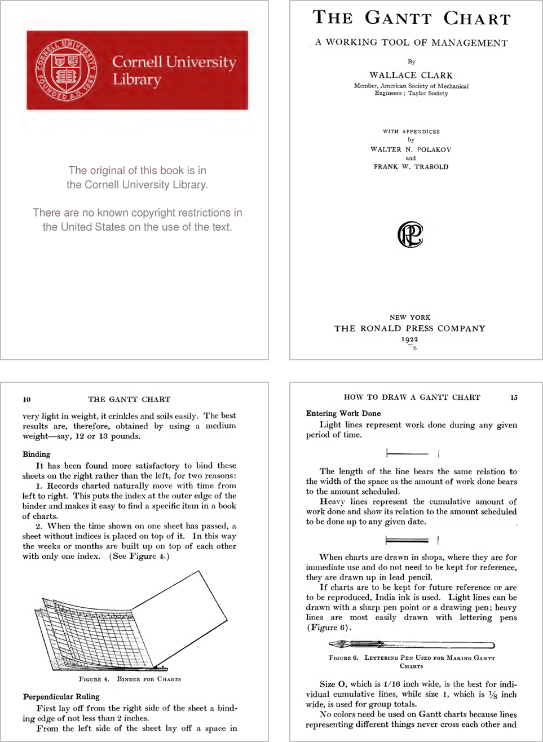 Unfortunately, however, this technique causes the import of hardly-legible and difficult-to-handle tables on PowerPoint, side by side with graphs in a manner often like a summary. In addition, as soon as you try to enlarge the characters, all the cells jump and it becomes impossible to fix them. In the above image, the table from excel has been copied and transformed in an attempt to resize the columns. The graph was copied side by side, and then we tried to make the activity lines coincide with the bars of the graph. Here comes the second technique. After copying from Excel, pasting it into PowerPoint as an image generates a result often worse than the first case because, to enlarge the numbers, you are faced with images enlarged manually, making them grainy. 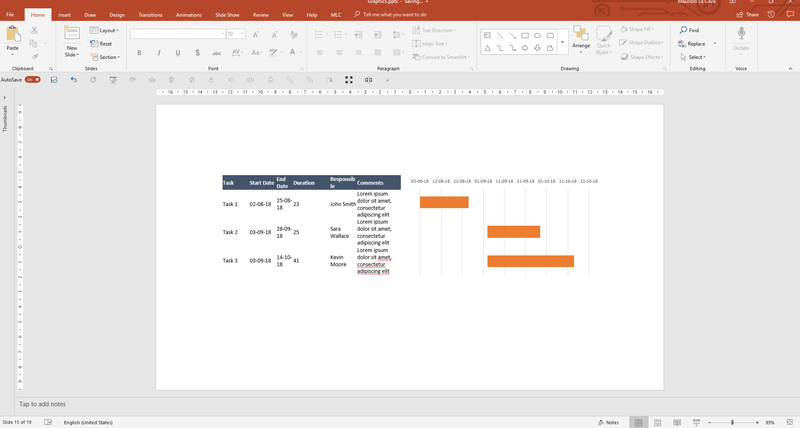 In short, every time you have to update the Gantt chart to present a project update, you must retrieve the source excel file in which the Gantt was originally created, modify it by integrating the updates, and then make a nice copy/paste in PowerPoint, applying one of the two techniques previously covered. The Gantt chart is a synthetic representation of a project that allows decision makers to understand the state of progress, to identify any delays and then to predict the consequences by means of a clear representation of the links between the activities. Knowing how the activities are linked to each other, it’s easy to understand the consequences of a possible delay on some activities. Since the purpose of a Gantt graph is to support and make strategic decision-making more efficient, there will always be a time when the Gantt diagram can be presented, and today presentations are generally, unequivocally, from a PowerPoint. 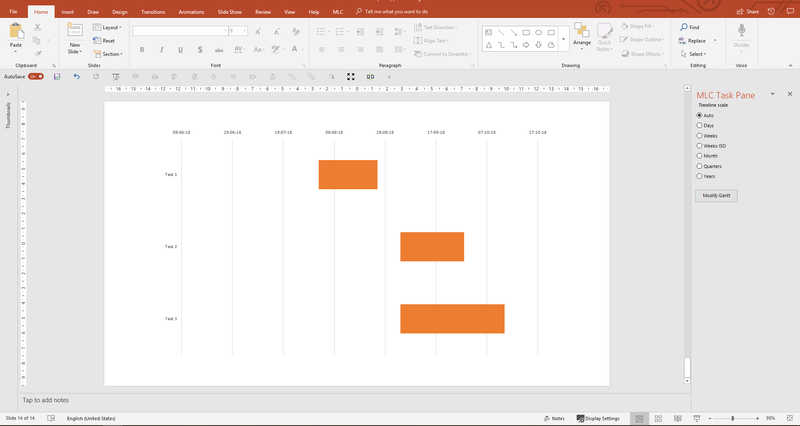 So, how could you draw or import a Gantt chart in PowerPoint clearly and efficiently? 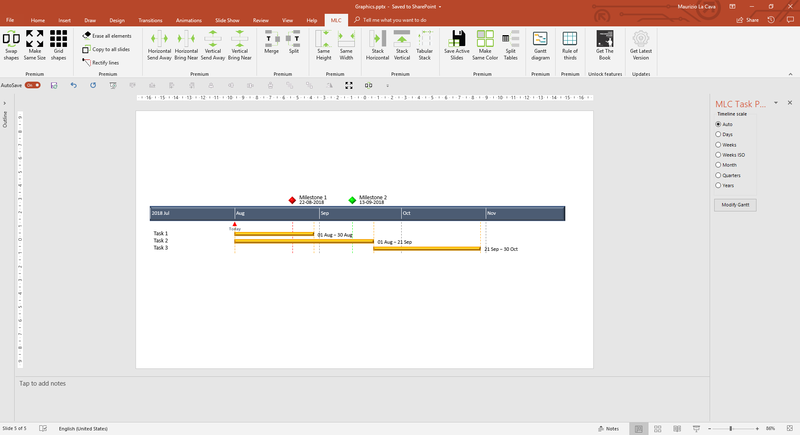 The challenge is to realize in a practical way a Gantt diagram in PowerPoint, including the possibility of updating it as the project evolves. In PowerPoint, moreover, you need to work with shapes in order to make the diagram graphics consistent with the style of the presentation. If I copied an image from an external tool, albeit excel, you would be constrained in graphic editing. 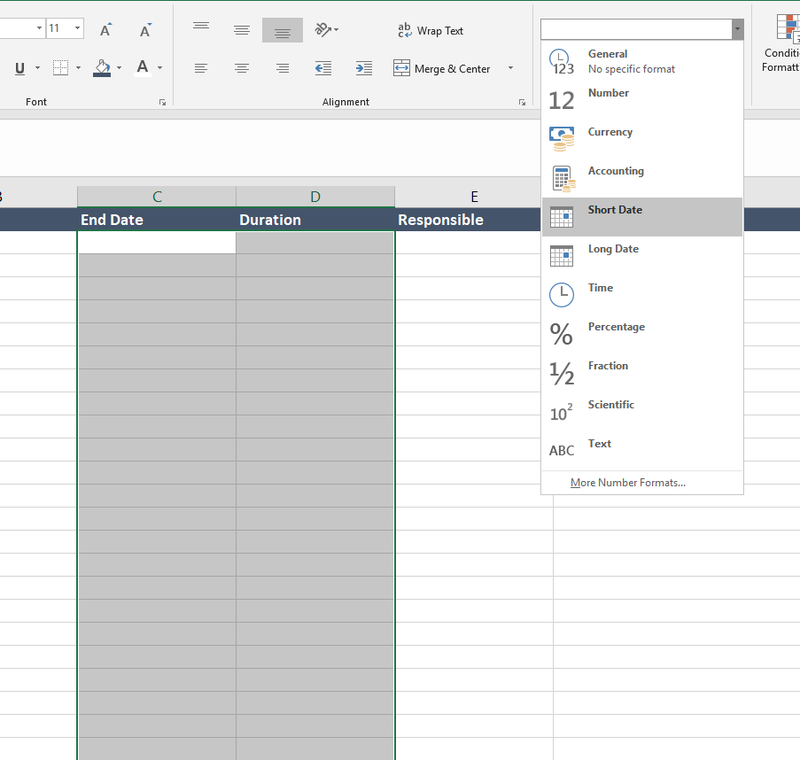 So you need a tool that allows you to work with PowerPoint forms by creating a Gantt chart automatically for you. 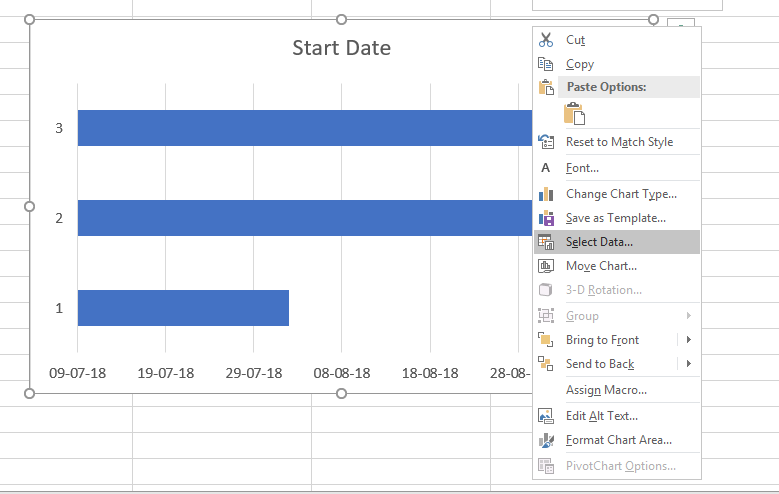 Since you are not the only one with this issue, I added the functionality to easily create Gantt charts directly in the MLC PowerPoint Addin. 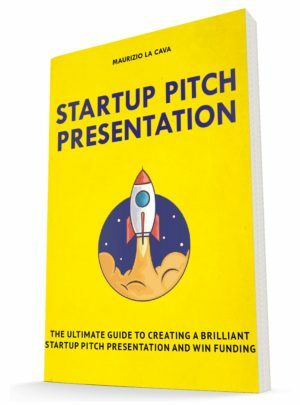 If you do not know it, this is my personal PowerPoint Addin, in which I add all the features that speed up and significantly improve the quality of my presentations. In this article, I will not comment on all the other features. 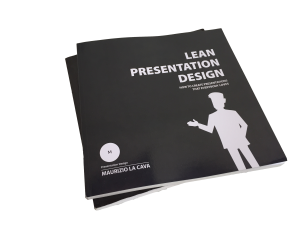 If you are curious to discover them, I suggest you visit the dedicated section of the site: click here to see the MLC PowerPoint Addin page. As you can see, I added the functionality to create Gantt charts and I would like to concentrate on this. When you click on the “Gantt diagram” button, an easy-to-understand window opens up, showing a series of essential options for creating your next diagram. 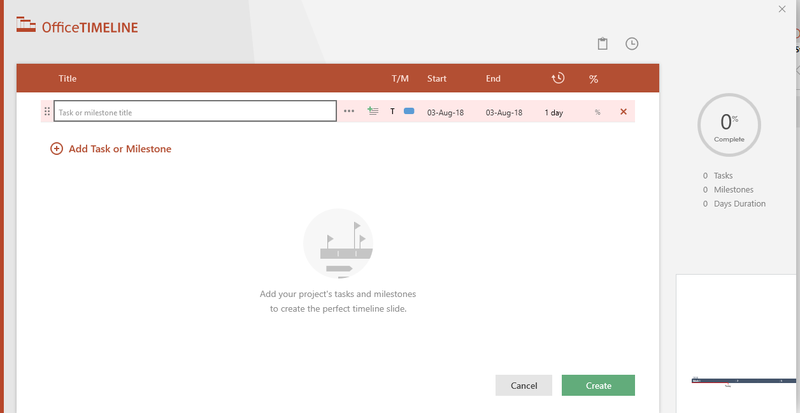 As soon as you open the window, you are in the tab called “Task”, where you can create your activities simply by writing the name, and defining the start and end date. You can select the date with a simple click from the calendar, or enter it by writing in the window, respecting the format. I prefer to select it from the calendar! You can also assign a color to the activity to create groups of activities that are visible at a glance. The tool will repurpose the diagram for you at a click. Finally, all you have to do is set your milestones. “Def. Milestone is an English term that literally means milestone. In the English form, the term is used primarily in technical disciplines such as software engineering or project management. Indicates important milestones in the development of the project.” – Wikipedia. I usually assign milestones according to my deliveries to customers, but you can use them as you like, depending on your project and your needs. Note that the milestone is not an activity that has a beginning and an end, but a specific moment in time when, for example, a delivery is expected. For this reason, a precise date is indicated. At this point, pressing “OK” will immediately generate the Gantt graph with the specifications indicated. 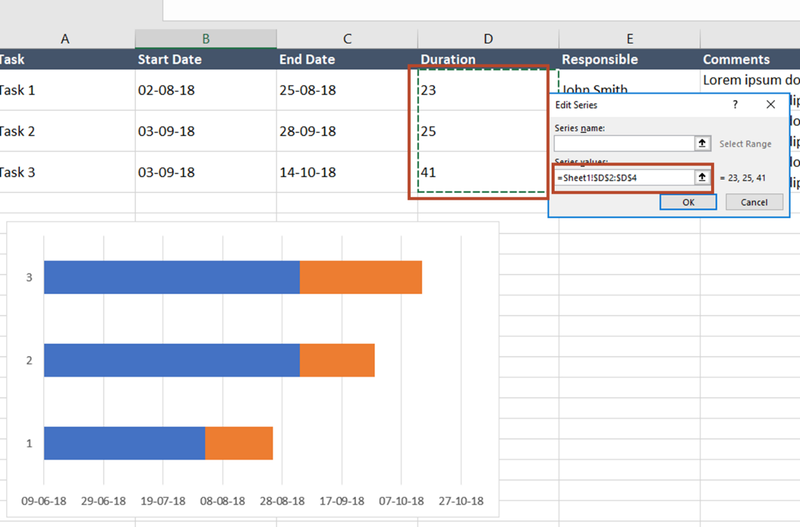 The chart allows you to see all activities, just like a traditional Gantt, and adds the exact duration next to each bar, so you can always have the details at your fingertips. An arrow is automatically added, indicating today’s date, and milestones are displayed above the timeline. Each milestone is marked with a title and a date, presented immediately below the title. In particular, the milestones have a dotted line that shows exactly where they fall, allowing you to easily relate them to the activity bars. How long did it take us to generate the Gantt? Very little, right? The fact that it is all driven allows you to work in a very efficient and precise way. 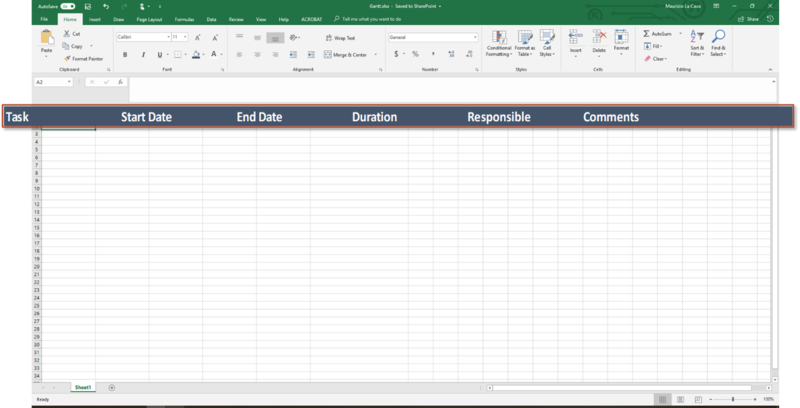 Moreover, once the procedure to create a Gantt chart with MLC PowerPoint Addin is followed, the diagram is manifested as a set of standard PowerPoint forms that anyone, even without the addin, will be able to view and modify normally. Quickly change the timeline details. Open the Gantt chart editing panel again. Try clicking on “Modify Gantt” and enter a new activity. Now generate the Gantt by clicking on “OK” and display the new activity. MLC PowerPoint Addin allows you to create and even manage the Gantt charts in your presentations in a simple and intuitive way, through a wizard that contains the information essential to the realization of a real Gantt chart. I created a quick animated gif to show you the process of creating a Gantt chart with the MLC PowerPoint Addin. The historical PowerPoint addin that has always worked on optimizing the charting process. I used it when I worked in Accenture. In fact, ThinkCell at the time was the only tool that allowed you to create waterfall charts in a simple and intuitive way directly in PowerPoint. Over time, the waterfall charts, like other features that distinguished it, were integrated into PowerPoint and I stopped using it. However, ThinkCell has an original way of approaching the creation of Gantt in PowerPoint, and I think it is therefore worthwhile to show you how they do it. The advantage of ThinkCell is that it incorporates other features besides the Gantt, which brings efficiency into the way you work. Honestly, it is not an addin I use, for the simple fact that I find many of the functions that the tool offers are a little outdated now. However, it remains one of the most historic addins on the market and, especially for those with older PowerPoint versions, it can help. Be careful, though, because it is a tool that only sells to businesses and you can only log in with a private email domain, buying only at least 5 licenses at a time. ThinkCell proposes itself on the market with a price of €200 per license per year. 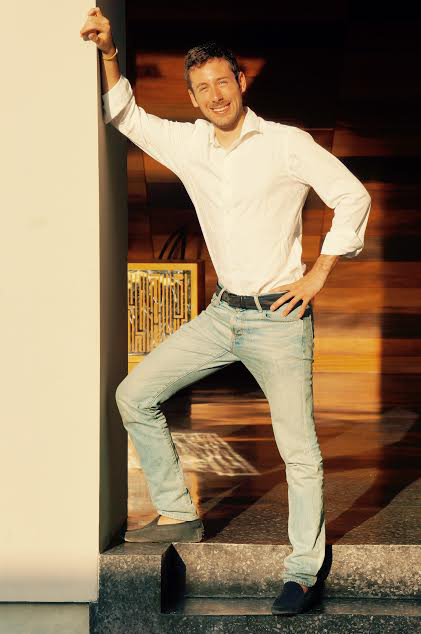 Thus, it is a minimum starting investment of €1000/year for 5 licenses. This add-in is dedicated exclusively to the creation of timelines and therefore, we can say, of Gantt chart. Unlike the other add-in I told you about, this has no other functionality. This is why it offers more possibilities in creating timelines. Click on “New” to create a new timeline. 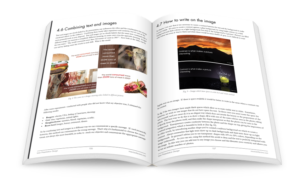 You will be offered a list of templates from which to choose a style that you prefer. Alternatively, you can always continue with a timeline created from scratch. Let’s try to create a whole graph starting from scratch. The first window you encounter allows you to enter tasks with a start date and end date. Add your activities. I’ll add 3 to show you how it works, the same way as we did when we did the demonstration to create Gantt with the MLC PowerPoint addin. 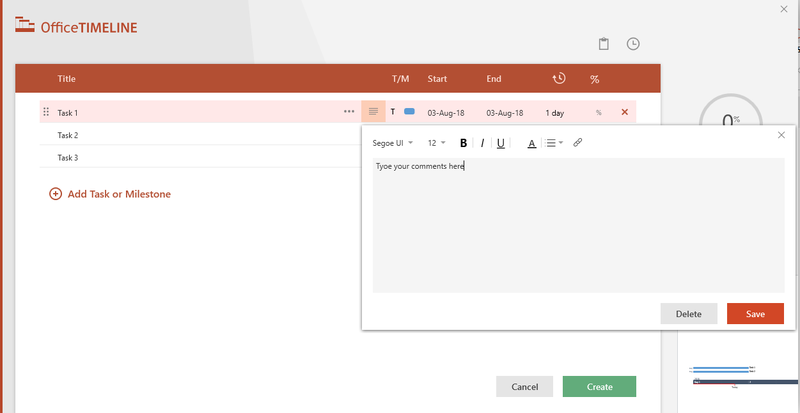 Office Timeline gives you the ability to add a comment for each activity. Click on the small “T” to define whether each row is an activity or a milestone. In the selection of the milestone, you will notice that the end date coincides automatically with the start date, for the simple fact that it is a milestone, not an activity, as we said above when I explained the concept of a milestone. You can select the start and end date via the calendar windows that open with the drop-down menu. As soon as you are ready, generate the diagram. As soon as it is created, you will notice that it is a set of default PowerPoint forms, which you can modify as you wish. I have shown you three possible alternatives, all equally valid. Be careful though, because the three products offer very different functionalities, even though all three of them fulfill the need to create a PowerPoint Gantt chart quite quickly. In fact, ThinkCell is an addin specialized in creating charts, including the Gantt. However, I must admit that it is a bit outdated, as I said, and that part of the historical features of this tool is now the standard of PowerPoint. 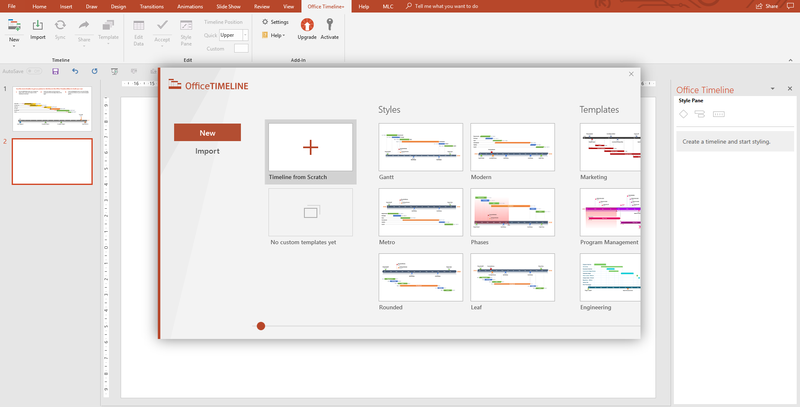 Office Timeline is by far the most complete tool on the market for generating timelines. However, the specialization obviously prevents them from developing any other functionality. MLC PowerPoint Addin is a complete tool that aims at the efficiency of those who make presentations, is constantly evolving and constantly releases new, interesting features. 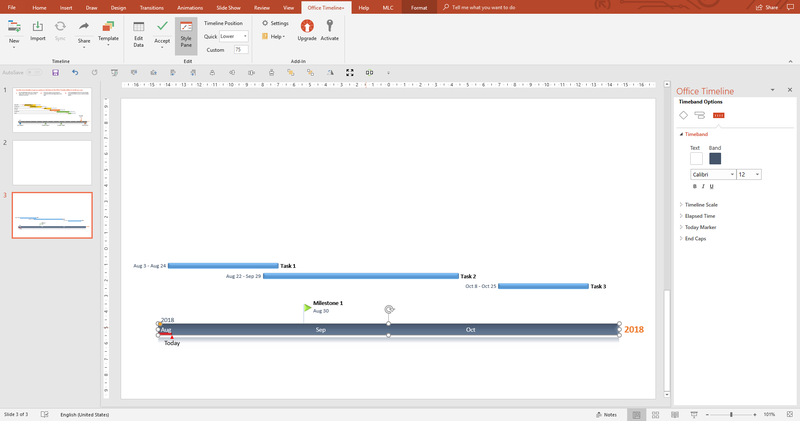 It has a powerful function to create Gantt charts in PowerPoint, but it is not as extensive as Office Timeline, but it is quite similar to ThinkCell. 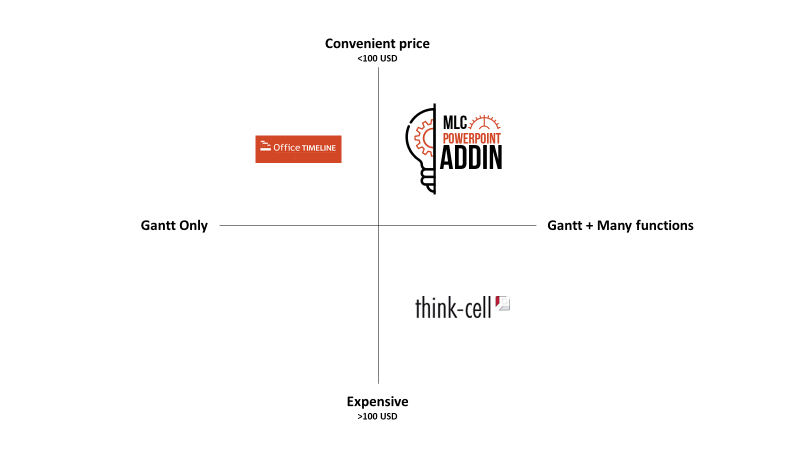 If you also ask what the prices are, I anticipate that ThinkCell is the most expensive (almost 4 times the price of others) while the other two are around $60USD/year. I leave you the choice and I’d love to read your comment on this post, letting me know which tool won your attention. 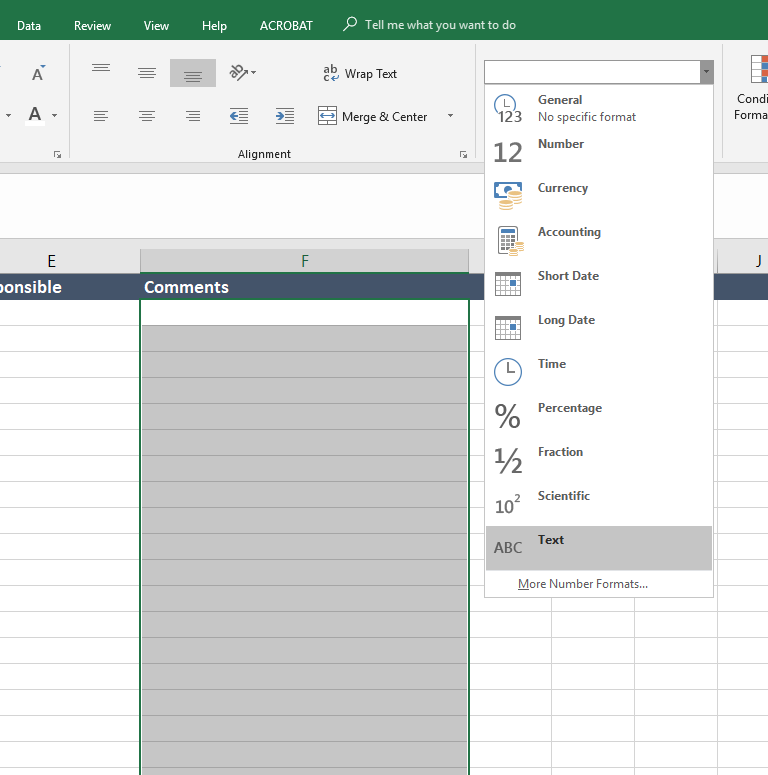 In the absence of the possibility of using one of the tools, before leaving you to venture into Excel, it is worth mentioning the technique of using a prepackaged template. In fact, you just need to do a quick search on Google to find many ready-made PowerPoint templates to customize. 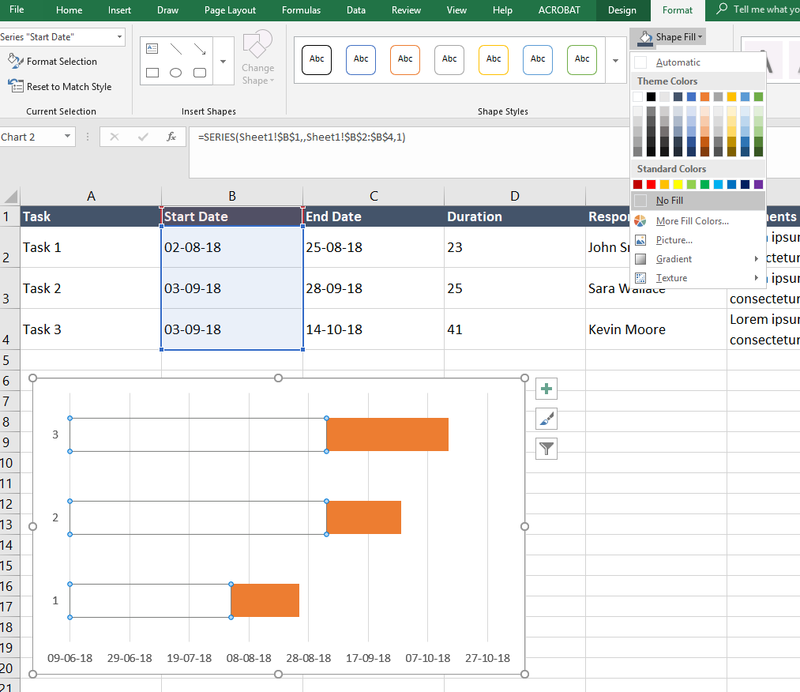 If you don’t need to present your Gantt chart, you don’t need to use a tool that creates it automatically, and if you have a little more time available, the alternative accessible to all is, of course, Excel. If you’re wondering if you need to use these exact fields, the answer is no! These are the basic fields that I use for most of the projects I manage. Pay attention to the formatting of cells. 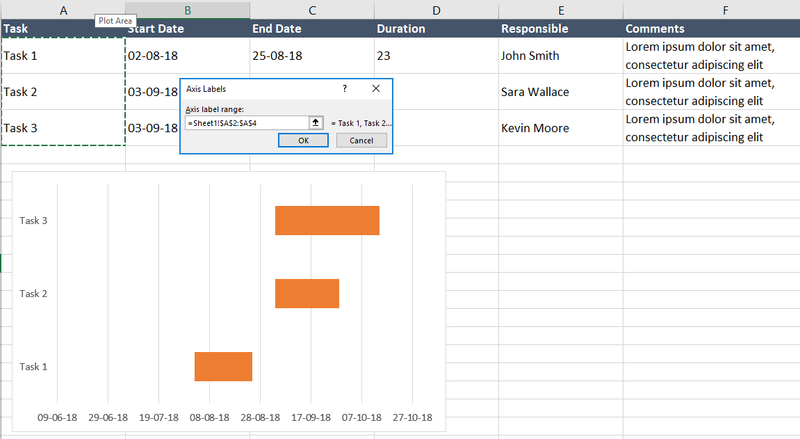 The data columns must be set to a date and comments to text. I’ll just use sample data to help illustrate my words. The idea is to use a double horizontal bar graph (stacked bar chart) and then to make the bar linked to the date disappear. This chart has the ability to stack more information per bar, but in this case, we are using only the start date. 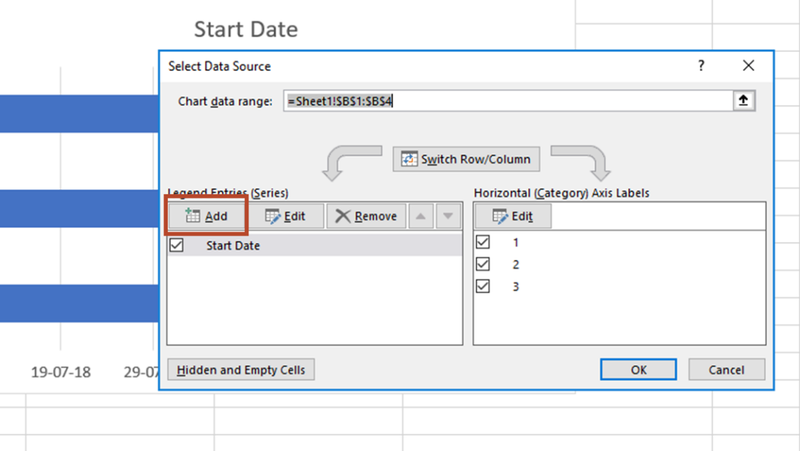 Add the duration as a new series by right clicking on the chart and selecting “Select Data”. Select the “Add” button to add a new series. Select duration data by entering them in “Series value”. 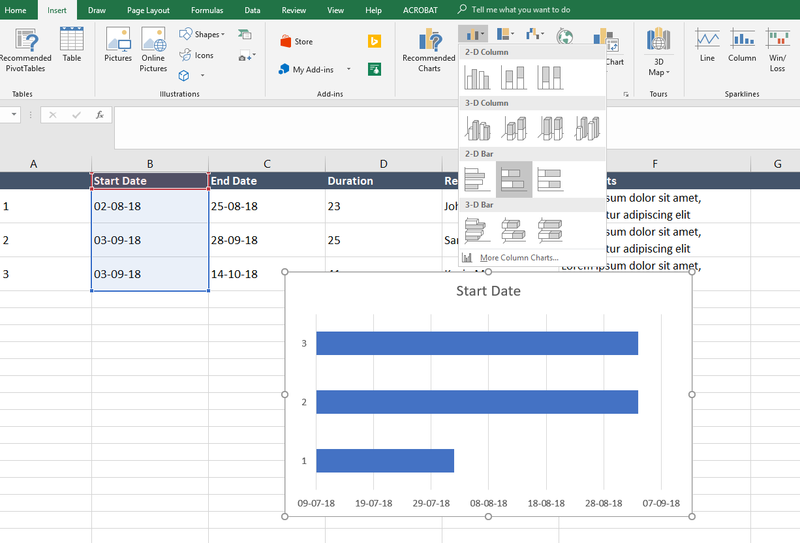 Remove the filling of the bars relative to the “Start Date”. Now we assign their name to the activities so that it appears on the ordinate axis. In the same window used previously, change the white box to the right, using the edit button. Select the names of the activities and click “OK“, so the activities take the name assigned into the graph. The activities are reversed. Look carefully: the first from the top is “3”, while in the table, you had “1”. To reorder the activities, just enter the format of the axis of the ordinates (the vertical axis) and select the option “Categories in reverse order“. The activities will be re-ordered and the dates will be arranged above the graph. Now it looks like a Gantt! You’re almost there! Now you just have to delete the white space that precedes the bars. It would be logical for the activities to start on the date that the first activity begins. To eliminate the white space, just make the axis zero coincide with the start date of the first activity. Select the abscissa axis (horizontal axis) and open the format menu. Copy and paste the start date of the first activity in the box of minimum value of the abscissa axis. This way, the horizontal axis will start from the same point of the first activity. Here is the cleaned up chart, with the activities that start from scratch. Now you can copy it and paste it on PowerPoint. 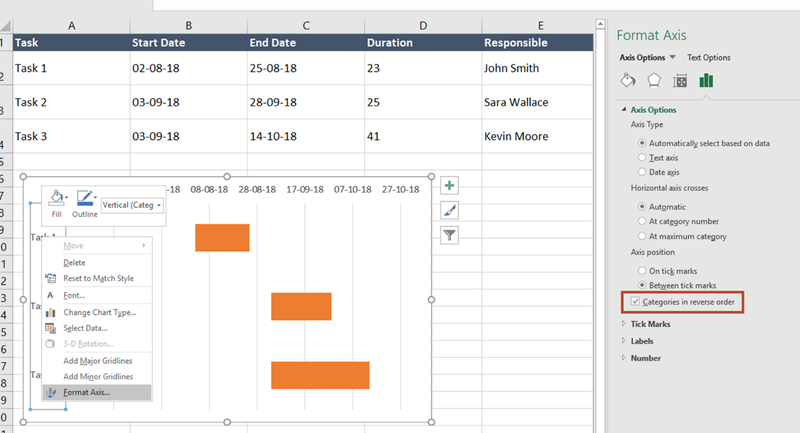 As you can see, you can generate a Gantt chart in Excel and import it into PowerPoint. It takes a lot more time and work than using a PowerPoint addin to do it directly. A simple and effective tool for planning work. 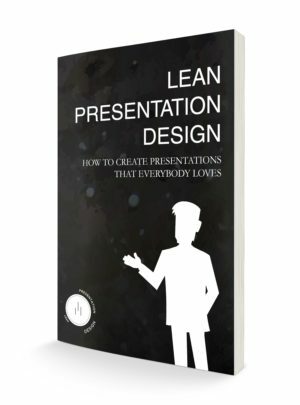 A simple way to present complex projects. A way to eliminate waste. A method to obtain clear results in fixed times. It makes the activities and responsibilities of everyone clear to all observers. Because of this, it is easy to know who to refer to, in case something doesn’t go as planned. The Gantt is so easy to understand that it can be enjoyed by anyone at any level of hierarchy and seniority. The diagram compares what has been done with what is to be done, keeping everyone aligned and, if something goes wrong, you can quickly identify the cause. The Gantt greatly facilitates the decision-making process by allowing project managers to devote themselves to the study of trends and the planning of activities, rather than to the continuous comparison with what has been done to determine progress. 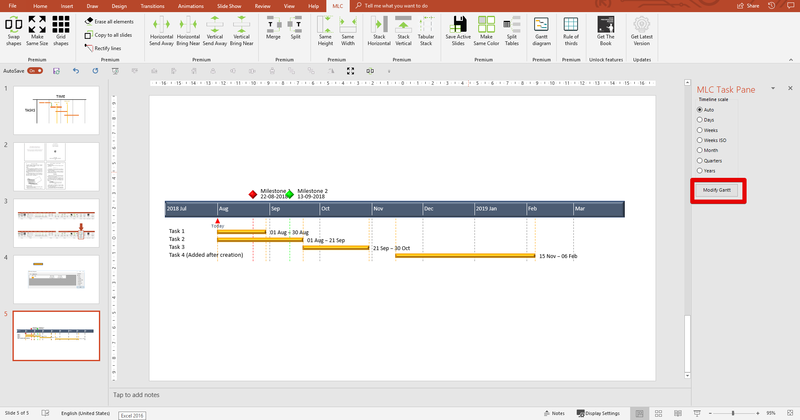 The Gantt can represent complex sets of activities on a single graph and summarize entire projects in a slide. I’ve supplied several ways to make this happen, but PowerPoint is certainly the main tool to present it. Remember, it is not just a matter of generating it, but also updating it, so carefully consider the time you save with a dynamic solution that allows you to update the diagram, building on the work already done. What choice did you decide to implement for the creation of your next Gantt chart? Answer me in the comments, as I would like to know!